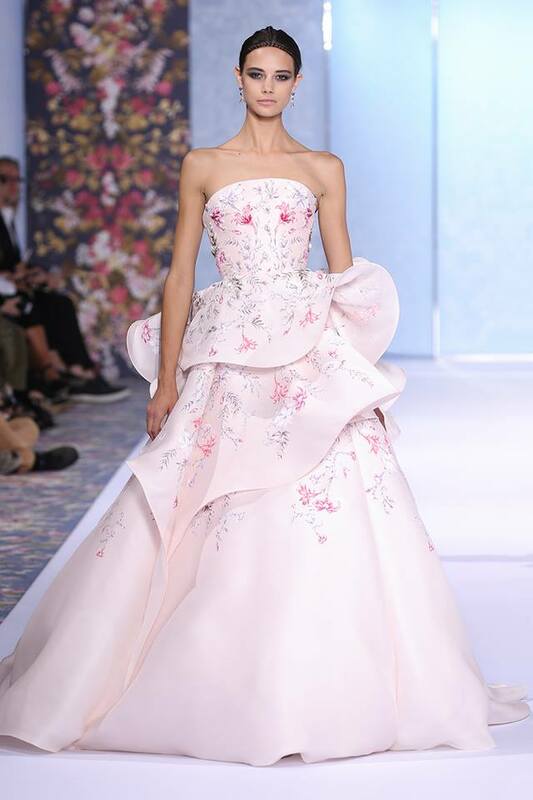 British fashion house Ralph & Russo presented their new Haute Couture fall/winter 2016 collection in Paris. 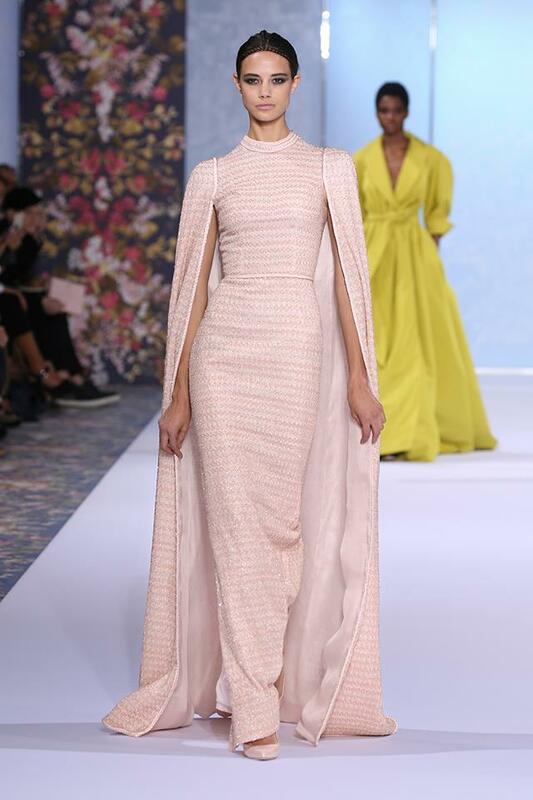 Creative directors Tamara Ralph and Michael Russo delivered another breathtaking collection. 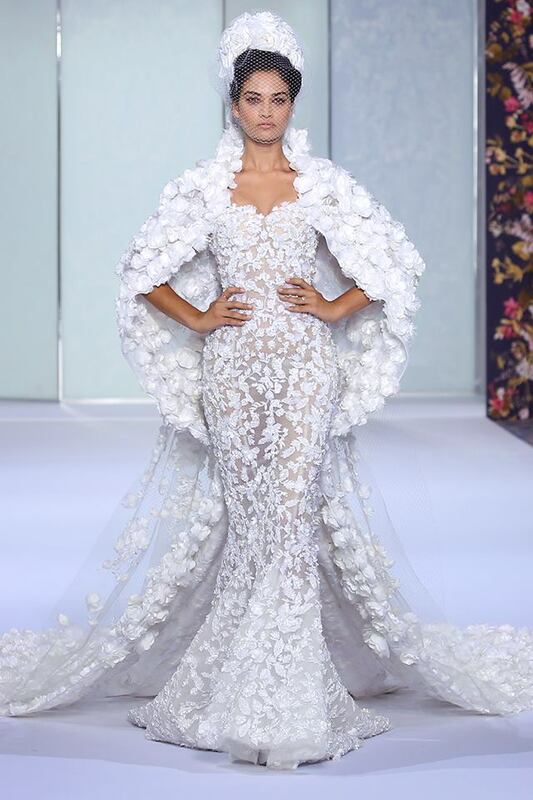 Model Shanina Shaik closed the show wearing white tulle fishtail gown, luxuriously embellished with silk thread-work, crystals, glass beads and pearls with a silk organza and feather flower appliqué cape. 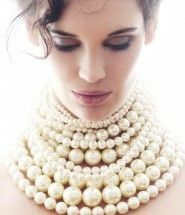 Accompanied by a tulle veil adorned with taffeta cut-out flowers, crystals and pearls. 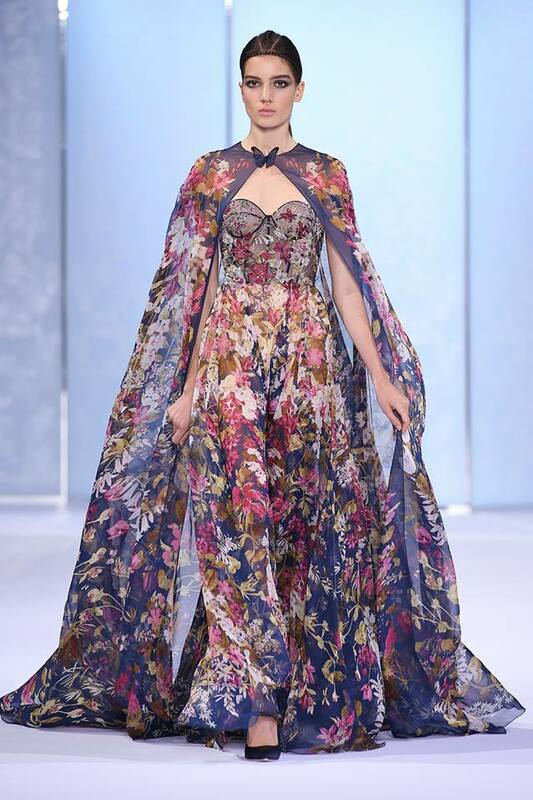 Midnight blue floral silk chiffon gown and cape with sheer bustier, embellished with crystals, glass beads and silk thread-work. 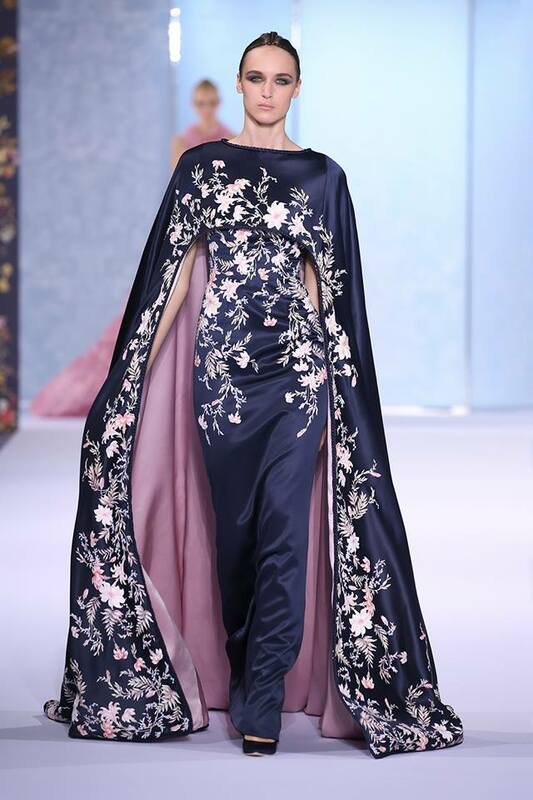 Midnight blue silk double satin gown with floor-length cape and braided trim, hand-painted with a botanical design and embellished with crystals, glass beads and metallic thread-work. 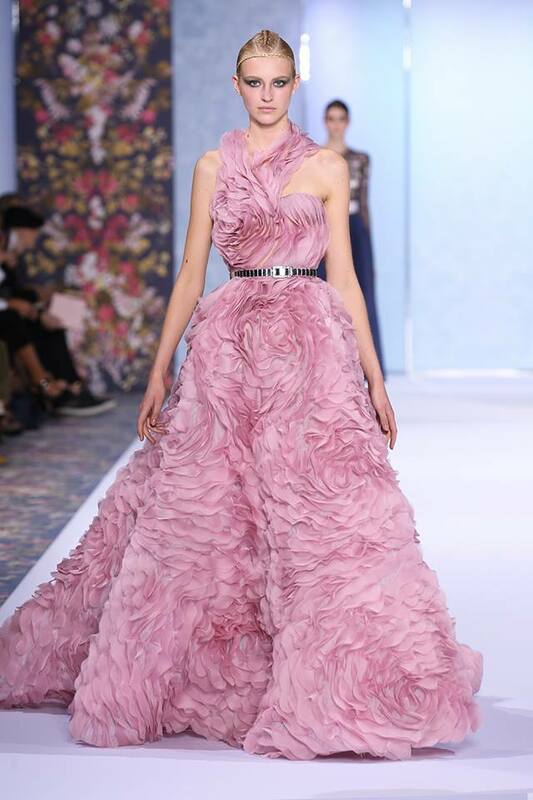 Amethyst pink silk organza ball gown covered with hand-appliquéd, textured, floral ruffles. Pale pink silk chiffon skirt with a silk organza crosshatch ribbon body, hand embroidered with metallic glass beads. Pale pink silk organza gown with floor-length cape and sheer tulle back, geometrically embroidered with glass beads and finished with a braided trim. 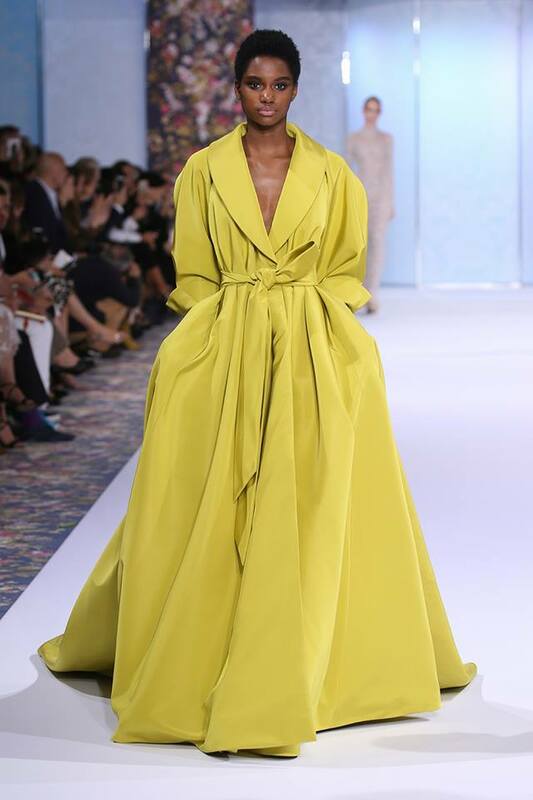 Chartreuse silk faille opera coat with obi belt, box pleats and voluminous sleeves. Ice grey silk double satin draped gown with plunge neckline, open back, centre front knot and braided trim. Ice lavender silk chiffon pleated gown with plunging neckline and braided belt. Pale blush silk chiffon gown with flowing cape and plunging bustier bodice, embellished with crystals and glass beads. 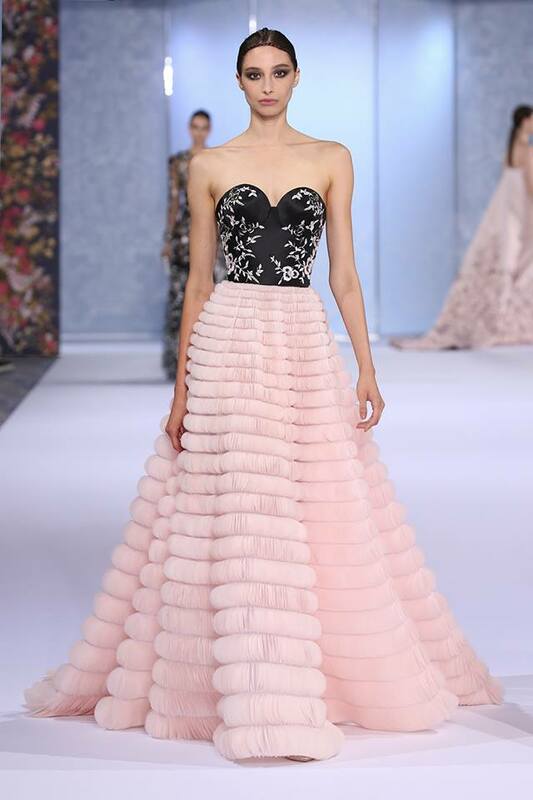 Black duchess satin and pale pink ball gown, hand-appliquéd with a dégradé of silk organza scallops and intricately embroidered with silk thread-work, sequins and glass beads. Steel lavender silk duchess satin gown with asymmetric pleated bustier and voluminous draped skirt. 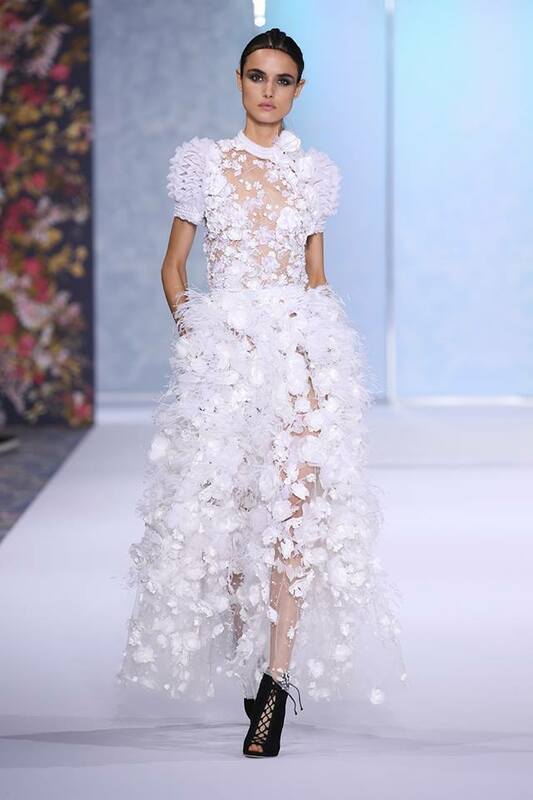 White tulle gown with silk organza pin tucked collar and ruffle cap sleeves, crystal and pearl embellished bodice and voluminous skirt appliquéd with silk flowers and feathers. Midnight blue tulle skirt and bomber jacket appliquéd with taffeta cut-out flowers, accompanied by a silk organza cross hatch ribbon body, embroidered with metallic glass beads. 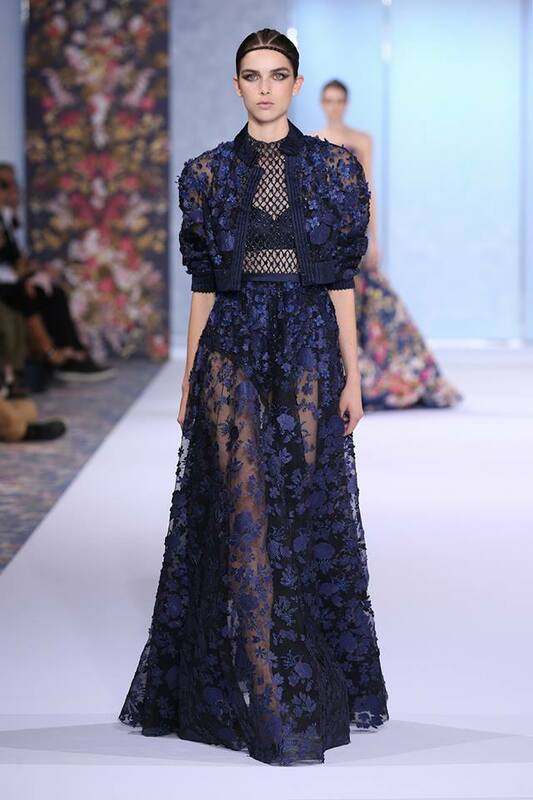 Metallic midnight blue Chantilly lace gown with cape, hand appliquéd with feather butterflies, silk satin, organza and leather blooms. 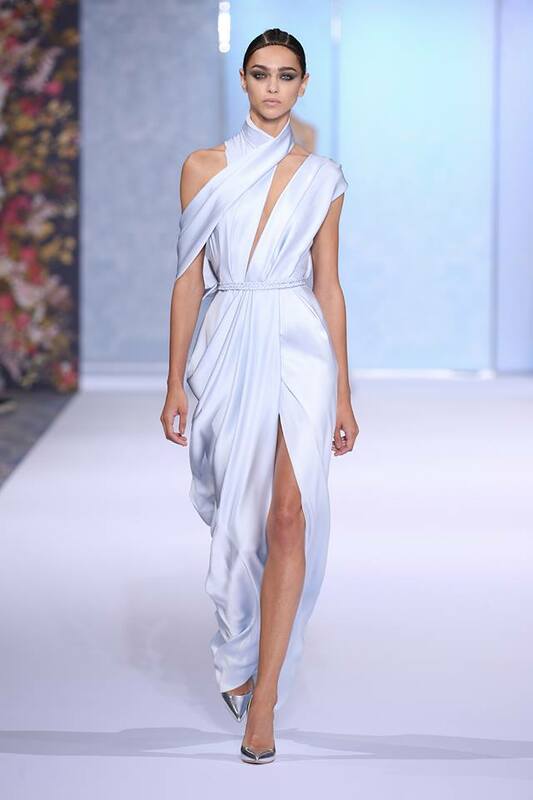 Pale blue silk double satin gown, asymmetrically draped with open back, keyhole front and braided belt. 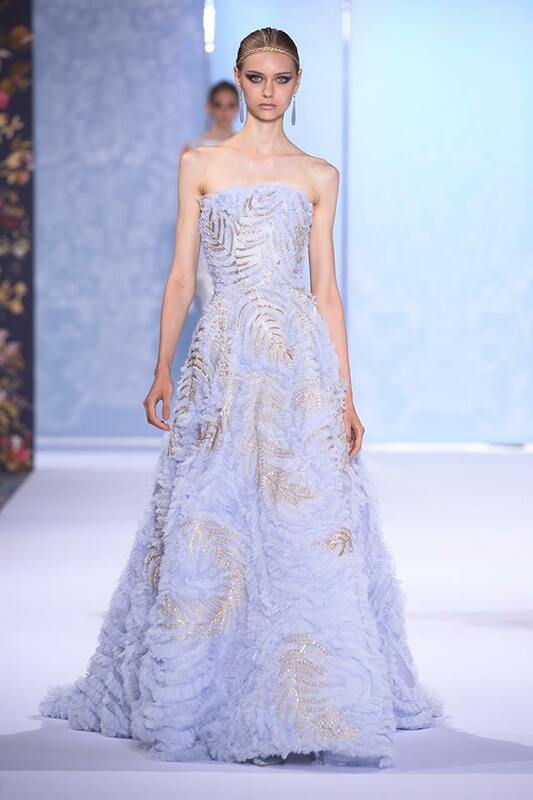 Pale blue silk organza strapless gown, appliquéd with silk tulle ruffles and embellished with glass beads and gold feather thread-work. 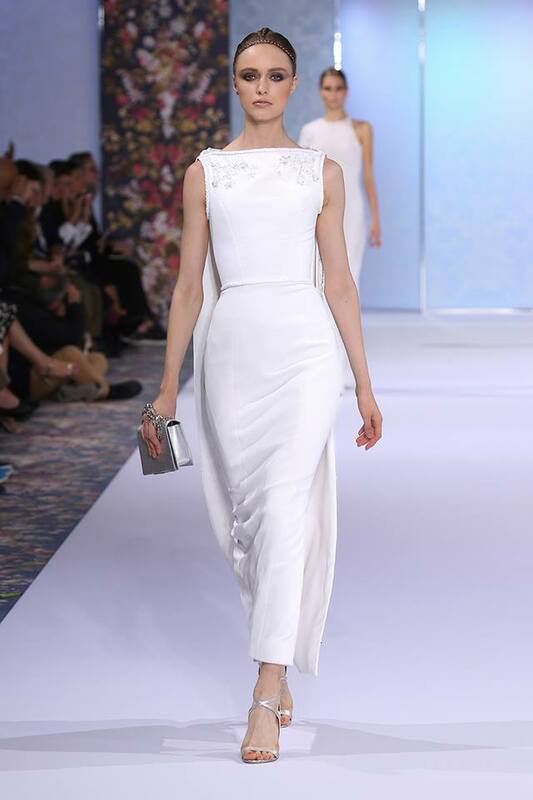 White silk crêpe pencil dress, ornately embroidered with crystals, glass beads, pearls and China blue thread-work. 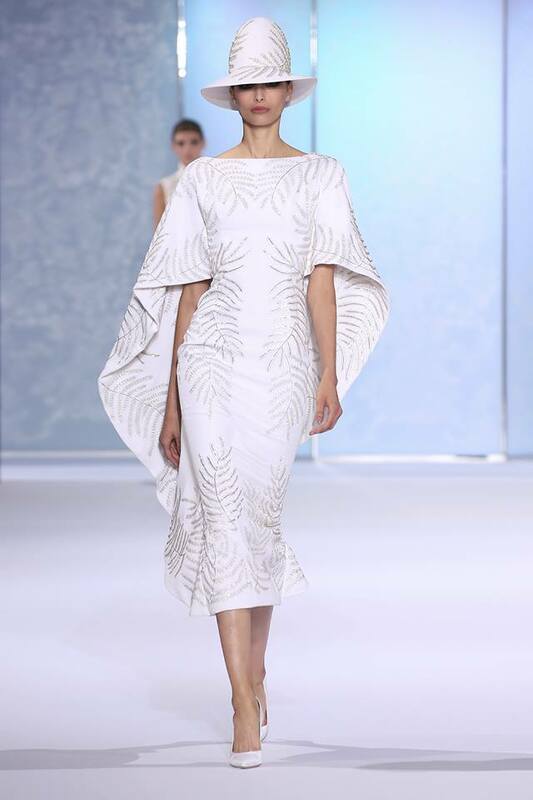 White silk crêpe kaftan dress, embellished with glass beads and silver feather thread-work. White silk crêpe tailored gown with cape and braided trim, embroidered with crystals, glass beads, pearls and silk thread-work. Off-white silk crêpe mini shift dress with braided trim, intricately embellished with sequins, pearls and cashmere flowers. White tulle gown with long sleeves and centre front split, hand embroidered with silk cords, crystals and glass beads. 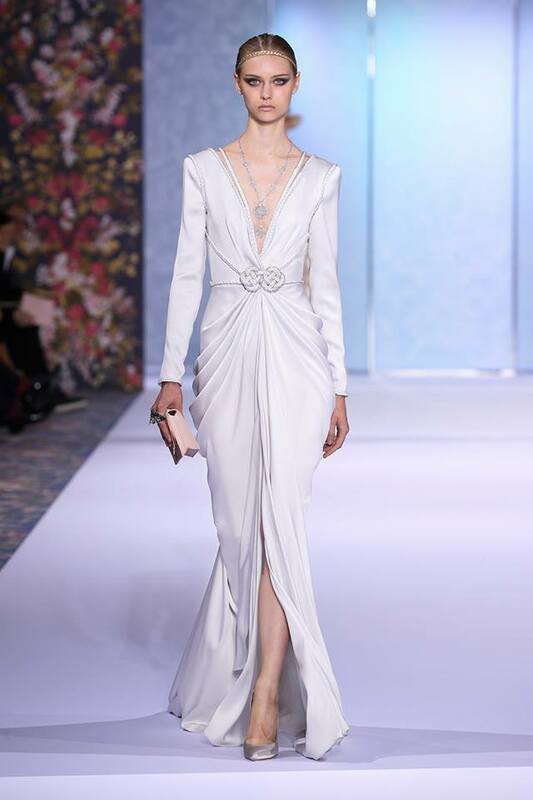 White silk georgette tailored gown with silk crêpe one shoulder cape, geometrically embroidered with glass beads, pearls, crystals and silk thread-work. 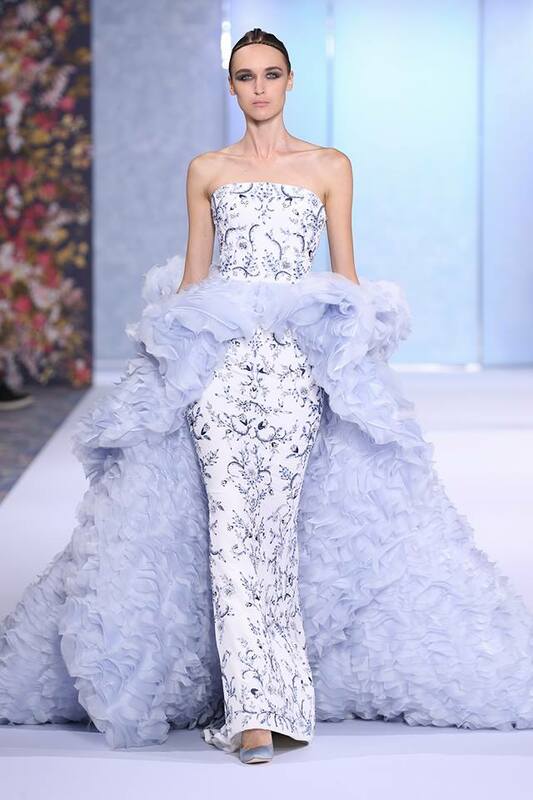 White silk crêpe gown with pale blue silk organza voluminous overskirt, hand-appliquéd with ruffles and elaborately embellished with China blue silk thread-work, crystals and glass bead embroidery. Pale pink silk gazar layered gown, hand painted in a botanical design with silk thread, crystal and glass bead hand embroidery. 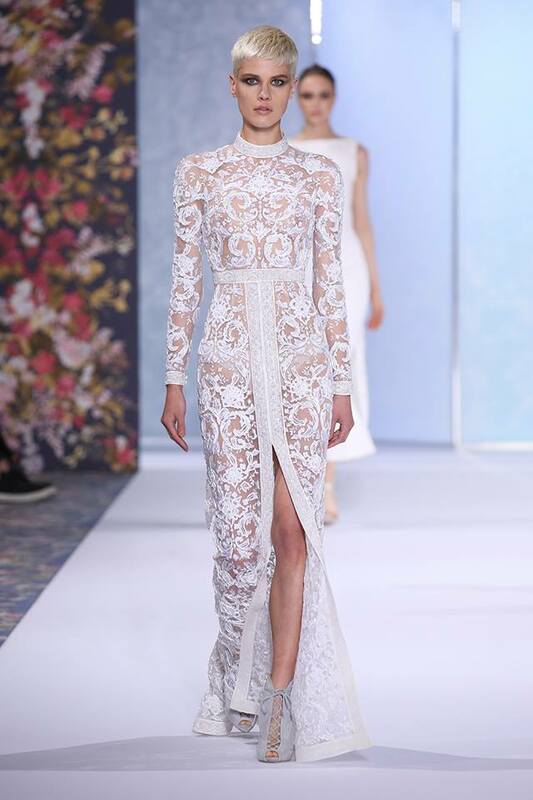 Shanina Shaik closed the who wearing white tulle fishtail gown.